Sumac is a dried, red spice frequently used in Middle Eastern cooking, and is made by crushing the dried berries of the sumac bush. It has a bright, tangy, slightly acidic flavor that has been quickly gaining popularity. Sumac is sure to jazz up just about any dish with an unexpected pop, Try sprinkling it over rice, hummus, tabbouleh salad, or mix it into a vinaigrette to dress your salad. It’s also the star of my Chickpea and Sumac Salad Recipe and would be perfect to add to my Arabic Fattoush Salad! I have become absolutely infatuated with sumac, and have been finding lots of different ways to use it. Because of the recent rise of interest in sumac, many grocery stores are stocking it along with their regular spices. But you’ll also be able to find it at specialty retailers, like Whole Foods. I usually just buy mine from Amazon, because I can get a bigger jar for a great price (we use a LOT!). 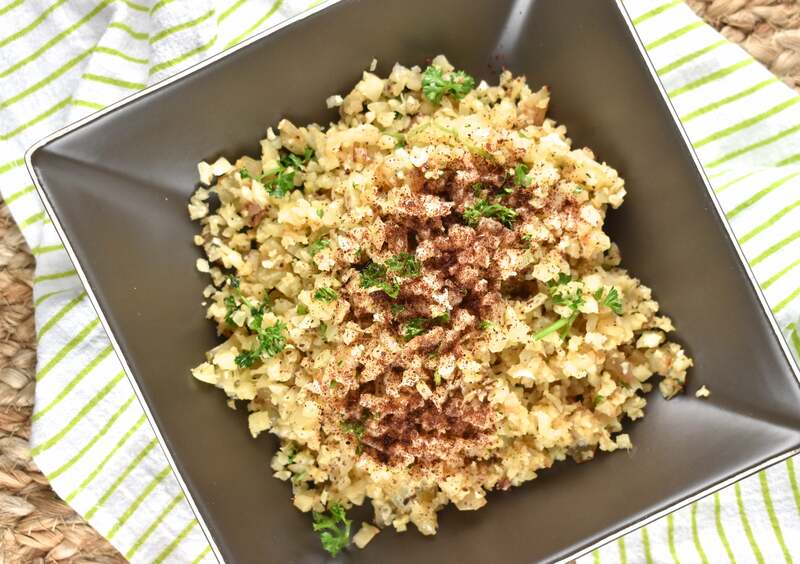 Cauliflower rice is really an easy side dish recipe that has fantastic flavor and will work well with a variety of meals. But if you are expecting it to taste exactly like rice, you might be disappointed. It does taste like cauliflower! Enhanced with all the wonderful flavors of all the other ingredients, of course. 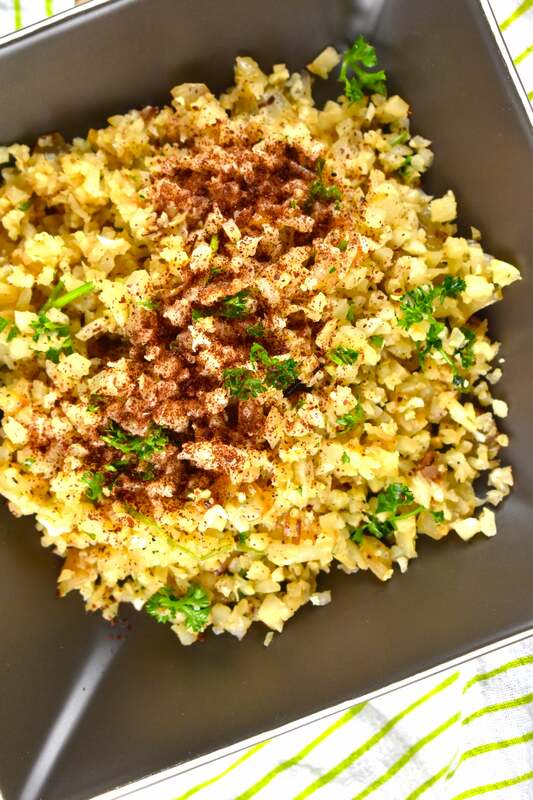 So if you love cauliflower as much as I do, you will LOVE this cauliflower rice recipe. You can serve it under a food in the same way that you would use rice. I love it under my Instant Pot Moroccan Meatballs or my Moroccan Fish Recipe. Or just eat it on the side, as is. 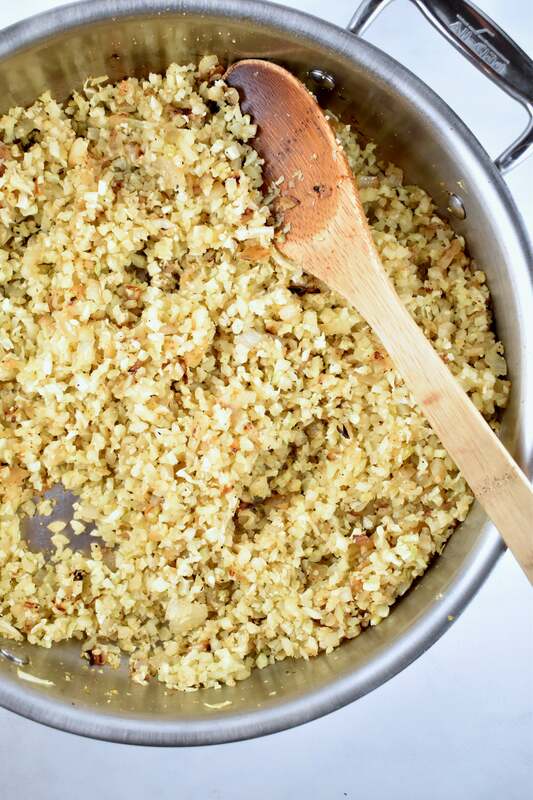 And if you happen to be following any other diet or nutritional program, this cauliflower rice works with just about all of them! It’s Low-Carb, Gluten Free, Paleo, Keto friendly, and Whole 30 approved. While these days, most supermarkets carry packages of pre-made cauliflower rice, both the fresh and frozen variety. But if you prefer it freshly made, you can do it yourself in minutes. Remove leaves and most of the core from the cauliflower. Chop or break the cauliflower up into small florets. Put the cauliflower pieces in food processor fitted with steel blade, and gently pulse until cauliflower has a texture is similar to rice. Be careful not to go overboard with the processing though, or you’ll end up with cauliflower puree. 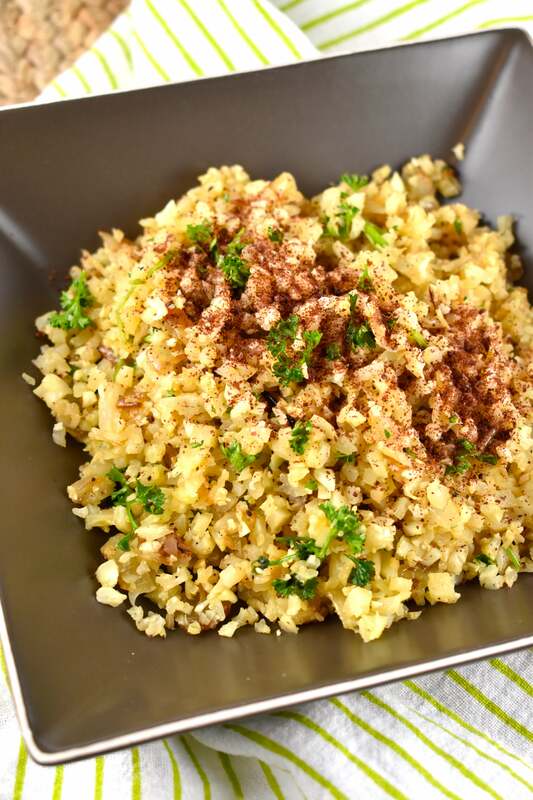 Need some more Low-Carb Cauliflower Recipe Ideas? Try these! 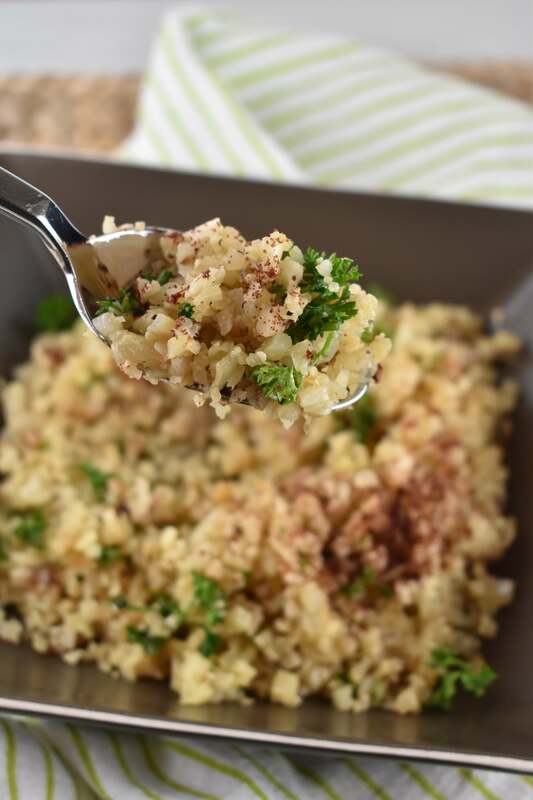 In this easy, low carb side dish recipe, cauliflower rice is sauteed with garlic and onions, then seasoned with the beautiful fragrant and tangy sumac spice. Add in onions and cook, stirring frequently for about 5 minutes. Then add in garlic and cauliflower rice. Season generously with salt, pepper, and a bit of the sumac. Turn heat up to medium high, and cook, stirring regularly, until lightly browned - about 4-5 minutes. Stir in fresh lemon juice, then transfer to serving plate. Sprinkle with remaining sumac, and top with fresh parsley.